How will you use the Aumsville? This extraordinarily versatile home fits so many different lifestyles. If you’re looking for a vacation home, this home will become an idyllic personal resort. 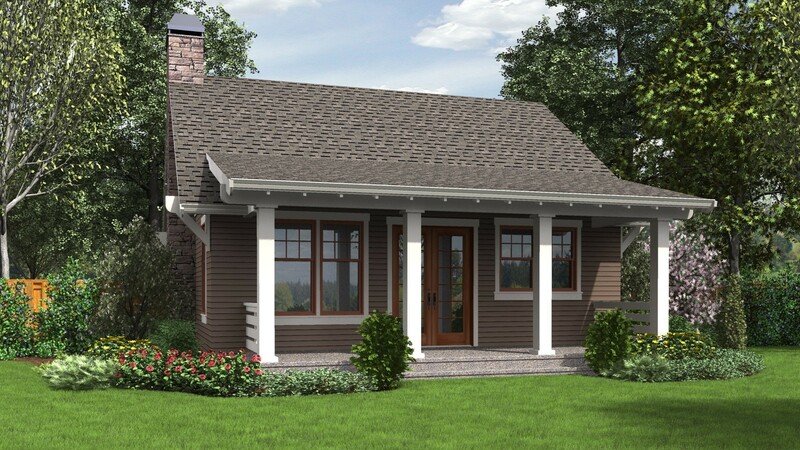 Empty nesters will enjoy the beauty and efficiency that the Aumsville provides. And, if you’re just starting out, this modest home makes a wonderful, cost-effective first investment. This home’s charm starts with its gorgeous exterior. There are so many inviting elements, starting with the beautiful stone porch and chimney. 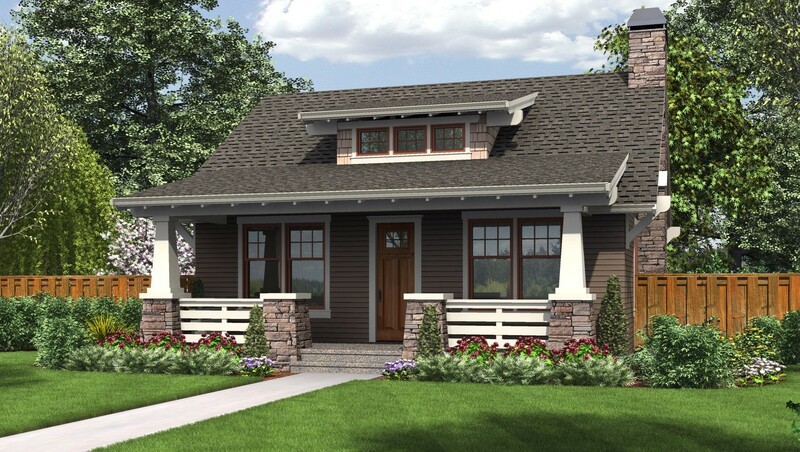 Craftsman style porch pillars add even more charm, while dormered windows complete the Aumsville’s welcoming look. To the rear of the home, you’ll find a matching back porch. French doors flanked by picture windows give the home such pleasing symmetry that you’ll want to spend hours enjoying the shade of this porch from a comfortable chair. In fact, few things will be more relaxing than the ability to look out over the rolling hills surrounding your cottage. Inside, you’ll quickly discover that a compact, single-story home can have almost as many amenities as a home twice its size. Live revolves around the great room, an open space with enough windows to give you a beautiful view of the countryside. When you return from a brisk walk through the autumn scenery, start a fire in the great room’s fireplace so that you can warm up as you catch your breath. Galley kitchens are known for their efficiency and ample work space, and this kitchen is no exception. Wraparound counters give you a place to prepare a feast for guests, but the compact size means that the range, pantry, fridge and more are all within your grasp. Within this home’s bedroom, you’ll have lots of room for a king sized bed and dressers. Just outside the bedroom door is a compact laundry area that puts you close to closet space when it is time to put away clean clothes. Right next to this is a smart compact bathroom with a large, beautifully tiled shower. One of the best features of this home is the guest bedroom. This room features a built-in guest bed that can be modified into desk space so that you have both a place to work and a place to host a friend that comes to stay. Shelving gives you a place to organize books and office supplies, while the picture window gives you or your guest a refreshing view of rolling countryside around your home.